I have been craving something fruity for dessert last night, and I was in charge of dessert for the family Sunday dinner. I have had about 2 pounds of strawberries just hanging out in my fridge for the last week. They were just waiting to be eaten or I was just waiting for the perfect time to eat them. 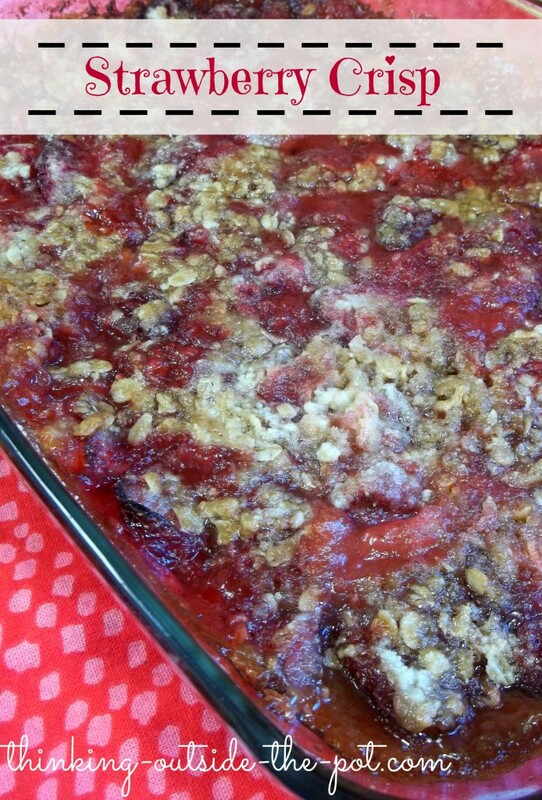 I love making crisps or cobblers because the fact that they are a super easy fix for a great dessert. You don’t have to put much effort into them, and that’s great! Right?? I know it’s not strawberry season, and unless you can find fresh strawberries on sale you just ain’t going to buy them. All though this recipe calls for fresh strawberries during the winter seasons it can most defiantly be made with frozen as well. It will taste just as good. So lets get baking! Next in a separate bowl mix together flour, brown sugar, butter and oats until they become crumbly. Use a pastry blender or a fork to do this. Sprinkle on top of your fruit mix in baking dish. Bake for 45-50 minutes until it is lightly browned. This is a great dessert to serve with vanilla ice cream or cream on top.